The flavor and nutritional properties of fruits and vegetables are determined by how you buy, cook and store them. Here’s how to ensure optimal nutrition and flavor. Buy fruits and vegetables when they are in season. You reap a lot: they are easy to find, cheap and packed full of flavor. Locally grown produce is the best; they travel shorter distances and are cheaper. Look out for color. The first trait to look out for is color. “as a general rule, the most intensely colored salad greens have the most nutrients,” writes Jo Robinson in eating on the wild side: the missing link to optimum health. Pay attention to the leaves as well, she explains: “plants with loose and open leaves, particularly the loose-leaf varieties, contain much more bio-nutrients. Buy small amounts of fruits and vegetables that go bad quickly. That way, you don’t have to throw food away. Avoid yellowing vegetables. That’s a sign of decay. Avoid fruits with bruises, blemishes and black spots, and fruits that are too soft, shriveled or moldy. Pick fruits that seem heavy for their size – this shows they have more juice. When buying ripe fruits such as mangoes, avocados, pawpaws, and lychee, choose those that are firm but yield a little when gently pressed. For vegetables such as artichokes and broccoli, go for the firm, tightly closed and heavy-for-their-size variety. When choosing potatoes, go for those that are chunky and firm. If they have sprouted and are wrinkled, they are past their sell-by date. If possible, buy fruits and vegetable whole. But, the Food and Drug Administration advises, when buying pre-cut, bagged or packaged produce, such as half of a watermelon or bagged salad greens, choose only those items that are refrigerated or surrounded by ice. Wash fruits and vegetables thoroughly before eating or cooking, making sure to cut away any bruises or blemishes. Use gentle washing when handling soft produce such as tomatoes. Use a different (and clean) cutting board when chopping fruits and vegetables. You don’t want them contaminated with germs from meats and seafood. According to the American Dietetic Association complete food and nutrition guide, clean thick-skinned vegetables and fruits well with a soft brush and water; avoid soaking them as you wash as some vitamins may dissolve in water. Don’t discard edible peels of vegetables such as potatoes, carrots, and apples as they have nutrients. When eating fruits and vegetables, aim for variety. That way you get a whole range of nutrients. Fruits and vegetables are packed with nutrients when they are fresh, but their nutritional value declines with time. 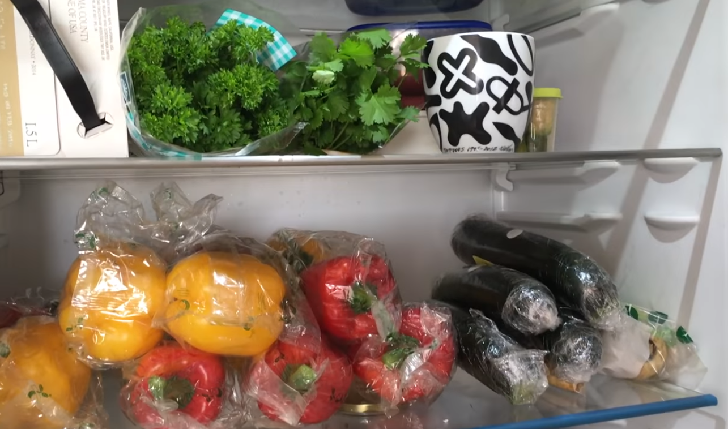 Eat perishable produce in your fridge first. Avoid washing produce such as strawberries before storage as this makes them spoil faster (dampness leads to the growth of bacteria). However, make sure to wash herbs before refrigeration. Don’t store fruits and vegetables next to or below the raw meat, poultry, and seafood. This can cause cross contamination. Bell peppers, grapes, citrus fruits, and berries deteriorate quickly. It’s best to refrigerate them when you’re not using them immediately. Don’t store fruits and vegetables that are sensitive to cold in the fridge. These include potatoes, cucumbers, and eggplants. Don’t store fruits together. Some – like bananas – have a ripening agent that will speed up the ripening of other fruits making them spoil faster. Don’t seal produce in airtight bags when storing as it leads to quicker decay. Fruits and veggies can make you happier: According to a study published in the American Journal of Public Health, eating more fruits and vegetables can substantially increase people’s happiness levels. The researchers theorize that antioxidants (commonly found in this food group) that have been linked to optimism could be a major determining factor. Flavonoid-rich foods – such as berries, citrus fruits, and red wine – can reduce the risk of erectile dysfunction in men, especially those under 70. This is according to a joint study by the University of East Anglia (UEA) and Harvard University. The risk goes lower if these foods are combined with exercise. Previous studies have shown that the Mediterranean diet is good for your heart. But Roy Hardman from the Centre for the Human Psychopharmacology Swinburne University of Technology and his colleagues found in a study that it is good for your mind as well. This diet is usually made up of fruits, vegetables, whole grains, legumes and olive oil. About those unhealthy impulse purchases: if you place your order an hour before eating, it might solve the problem. “Ordering meals when you’re already hungry and ready to eat leads to an overall increase in the number of calories ordered… By ordering meals in advance, the likelihood of making indulgent purchases is drastically reduced,” says Eric M. VanEpps, Ph.D., a postdoctoral researcher at the Penn Center for Health Incentives and Behavioral Economics. This supports other studies that show that decisions made in the heat of the moment are usually short-sighted. The benefits of drinking more water cannot be emphasized enough. A new study in the Journal of Human Nutrition and Dietetics shows that people who increased their consumption of plain water by one, two or three cups reduced their total daily calorie intake as well as their consumption of saturated fat, sugar, sodium, and cholesterol.